Find a great sale price on this 2011 Ford F-150 SVT Raptor at Mile High Motors of Helena in Montana. This 2011 Ford F-150 SVT Raptor is located at our dealership in Helena. We also serve the cities of Montana City, Unionville, and Louisville. 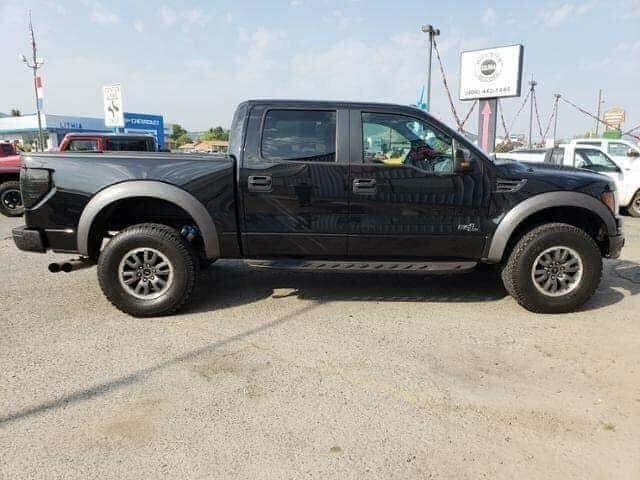 So if you're looking for a great price on this 2011 Ford F-150 SVT Raptor or just looking to get an auto loan for the vehicle you want... you've come to the right place! Mile High Motors of Helena. SVT Raptor trim. ONLY 42,367 Miles! Leather Seats, CD Player, iPod/MP3 Input, Fourth Passenger Door, Onboard Communications System, Satellite Radio, Alloy Wheels, Tow Hitch, Running Boards, 4x4. AND MORE! AutoCheck One Owner THE PERFECT FORD F-150 AT THE RIGHT PRICE An Exceptional Price for an Exceptional Vehicle. This used Ford F-150 is priced $1,100 below Kelley Blue Book KEY FEATURES ON THIS F-150 INCLUDE Leather Seats, 4x4, Running Boards, Satellite Radio, iPod/MP3 Input, CD Player, Onboard Communications System, Trailer Hitch, Aluminum Wheels, Fourth Passenger Door MP3 Player, Privacy Glass, Keyless Entry, Child Safety Locks. EXPERTS RAVE ABOUT THIS FORD F-150 F-150 has won the Motor Trend Truck of the Year award more times than any other truck. WHY BUY FROM US At Mile High Motors we strive to achieve one goal, 100% customer satisfaction. We accomplish this by providing quality motor vehicles at affordable prices while making sure our customers are never left unsatisfied. At Mile High Motors we have a great staff that will be able to assist you with all of your car buying needs, whether it is locating the right vehicle, obtaining financing, or anything in-between. Pricing analysis performed on 1/4/2019. Please confirm the accuracy of the included equipment by calling us prior to purchase.